No birthday celebration is complete without a decent pint of beer, so me and The Man tripped down to the local Wetherspoon’s last Friday for lunch and some ale. Now, don’t tell me off but I didn’t have a winter ale. 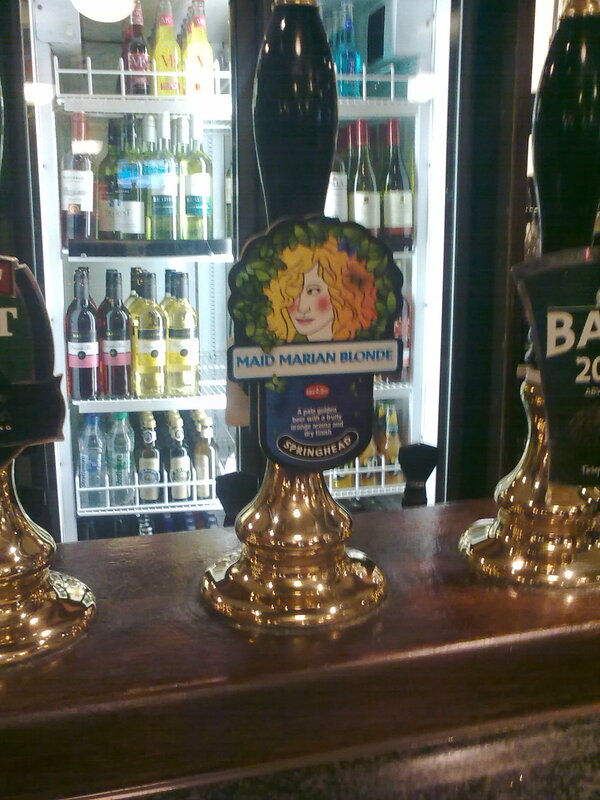 I was waylaid by Maid Marian, or rather Springhead’s Maid Marian Blonde. The pump clip described it as having an ‘orange aroma’ and a dry finish. I wasn’t entirely sure I was getting orange but it was a hell of a fruity pint – a bit like drinking a fruit salad. Had I not been going to the cinema after lunch I could have happily sat there drinking it all afternoon. The sunshine yellow colour of this pint, and its fruitiness, belied how full bodied it turned out to be. It was a highly drinkable mixture of sweet and sour with a pleasantly bitter finish. It makes me think I should have another birthday this week but without the trip to the flicks. Post cinema we quaffed a pint of St Austell Tribute at our local, but we are always somewhat perturbed by the temperature of the beer there. I wonder if it can be affected by the weather? By which I mean if the beer is stored in a presumably unheated cellar is it likely to be colder in winter than summer? Please share your wisdom and experience on this with me. I’m always keen to get more beer education and add to my knowledge base!